TheSupreme wrote: By the time a user is upgrading artifacts level 125+ they will be getting 40+ crew skills a day depending on how many crew they have. We aren't talking about players at that level. The system works great for players already getting 5+ skill points. But, if you aren't getting 5+ skill points. It's taking LONGER. Please step out of your head for a few seconds and see that we are talking about players at levels 1 through 20 (possibly more). The old system guaranteed 5 skill points. The new system only gets you 1+ skill point. How are you not getting this? But now, i wouldn't be surprised if soon a player comes into the forums and says "i can't explore planet X in kritilian and i'm level 90". I am just saying. Prickles, do me a favor. Be brave and fire your crew, just one of them, without spending flux on them and having no planets to explore... tell me just how long it will take you to upgrade your way back to 500/500/500. These are the issues the devs created with this ridiculously ill planned update, people sometimes accidentally dismiss crew thanks to crap button placement and no confirmation dialogue and on top of that they are encouraged to start exploring planets from day 1 which ruins your crew training. So how long does this new system take, it used to take over 5000 hours to get back to proper crew levels. I don't know the times, and maybe I'm getting bad intel on these times... but from what I can see is it will take a lot longer. I hope I'm wrong. Last edited by Draconis on Tue Oct 18, 2016 4:13 pm, edited 1 time in total. I don't see this as a problem, that's all. A new player will simply see exploring as something they need a bit higher crew for. 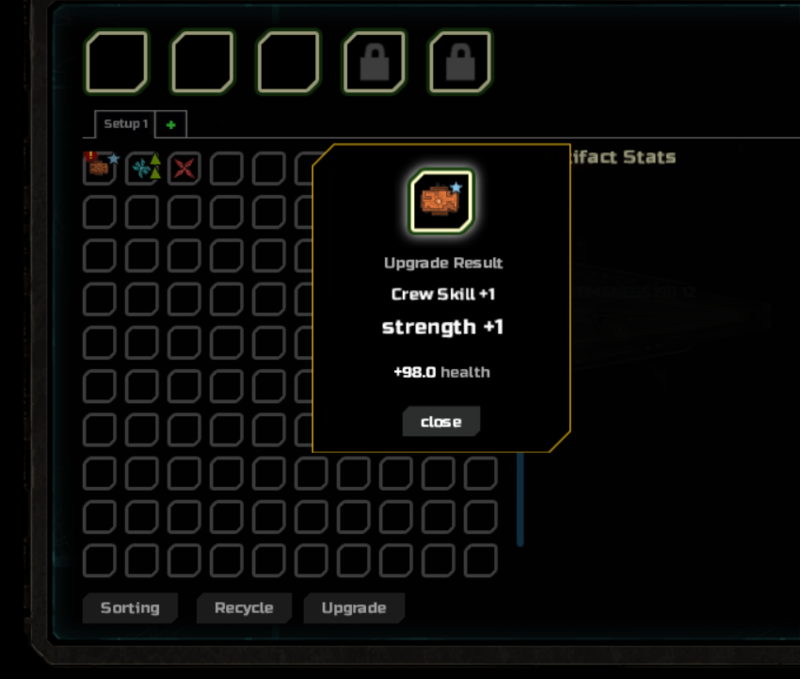 Crew skills are much much faster now, whether you realize it or not. There is no more getting stuck training for years like there was. Now anyone and everyone can do it in under 3 months! I would stop complaining. At least give it a chance. I'm not complaining. I'm just pointing out that brand new players are going to get screwed in this. But, sure don't read what we are saying. Keep thinking we view this change as bad (which I don't.. but, only for BRAND NEW PLAYERS!!!). It's not only for bad new players either. If you fired your crew. Oh boy. That would hurt big time. Old system of crew training at the start equaled less than 6 minutes to get 5 skill points. Under the new system. A strength of 50 to 60 is anywhere between 6 to 8 skill points.. in 4+ hours. In four hours under the old system you could get close to 40+ skill points. Under the new system? Four hours equals 6 to 8 skill points? 40+ skill points... or 6 to 8 skill points. I'll take the Old system for 1,000. Even at the highest amount. Only 20 skill points... And doesn't the time it takes to upgrade arts also increase with the level (strength) of the arts? So.. longer than 4 hours? How about 32 hours for 20 skill points? How many skill points could someone get in 32 hours of hiring a new crew in the old system? Last edited by TheCen on Tue Oct 18, 2016 4:32 pm, edited 2 times in total. Here's a thought... maybe the devs did the math on it and can tell us exactly how long it should take. You, prickles, should still fire a crew member for science just to confirm. @Supreme. What level art is that? I thinking it's way over level 50. Which just proves you aren't seeing what anyone is saying on this forum. This update is great for well established players. IF you aren't established or new... it's baaaad. Last edited by TheCen on Tue Oct 18, 2016 4:58 pm, edited 1 time in total. Here ya go. Level 0 or level 1 art. Still took 5 minutes to get 1 skill point. Level 13 artifact, this is the upgrade time, and below the reward. Hey, how about we lower the artifact upgrade times to max out at 6 hours? That should fix the "it's slower now" problem. traf wrote: Hey, how about we lower the artifact upgrade times to max out at 6 hours? That should fix the "it's slower now" problem. That's not even the issue. The issue is the 1 to 2 skill points players will get from art upgrades. It doesn't even come close to matching the old system. I suppose I would want an auto upgrade option for that case, since clicking a button every 45 seconds might get annoying. If anything.. the skill points should start at 5 points per upgrade and scale up from there. At least that would be somewhat more accurate to what was in place before. People can explore low level zones first to get better trained members, no new player will instantly upgrade artifacts. You only need 500+ for the best artifacts so it's less of a problem than it's being perceived as.